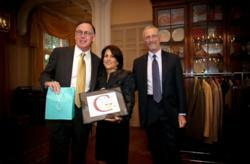 Piedmont real estate agent Dana Cohen named Top Producer for her office and #2 Agent company-wide for her 2011 sales. Oakland, Berkeley and Piedmont real estate agent Dana Cohen of The Grubb Company was named the Top Producing Agent for its Piedmont/Oakland office and the #2 Agent Company-wide in 2011. This marks the fourth time in the last five years that Dana has received the top producer distinction in her office. In 2011, she closed 37 transactions ranging from a cottage in the Montclair district of Oakland to an estate in central Piedmont for $2.65 million. Her average deal was in excess of $1 million and over 60% of her business came from referrals and new transactions from past clients. Her award marks her second professional achievement for 2011. Earlier in the year she was voted “Favorite East Bay Realtor” for the fifth time in a row in J. Magazine’s Readers Choice Awards. “Receiving these awards as I celebrate my tenth year in the business was particularly meaningful to me. I have the privilege of working with a variety of clients at different price points, each with a unique set of circumstances. Their varying needs motivate me to constantly find new ways to add value to each transaction,” Cohen said. “Dana has achieved true success this past year as the top producing agent at The Grubb Company in Piedmont and Oakland. This is not only quite an honor at our Company, but it also it resonates as a top business professional throughout Alameda County and the Bay area,” said DJ Grubb, President of The Grubb Company. For more information about Dana Cohen of The Grubb Company, call 510-339-0400 or view http://www.danacohen.com. Dana Cohen is a real estate agent specializing in residential properties in Piedmont, Oakland and Berkeley. As a second generation East Bay real estate professional with an annual sales volume that places her in the top 1% of agents nationwide, she has an in-depth knowledge of the local market that only comes from being an active member of the community for over three decades.